Linda is a Norwegian knitter who loves to design. Her background is in art history and she worked for a number of years with marketing and PR for architectural firms in London where she met her husband. After a few years she wanted to go back to her hobby knitting and applied for a job as Design Consultant for Rowan Yarns. After nearly 15 years in London she managed to convince her British husband to move back to Oslo 3 years ago. 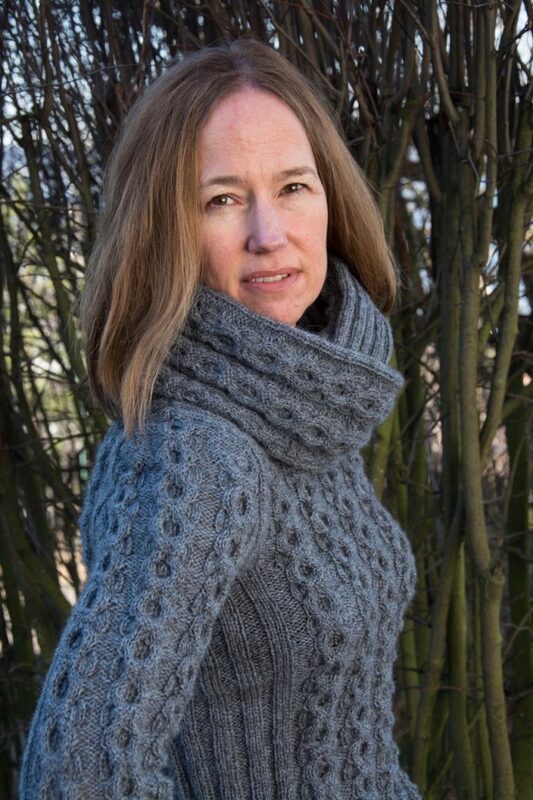 She currently designs for magazines like the American Interweave Knits, knit.wear and the Norwegian Familien, for yarn companies like The Fibre Co and Hillesvåg Ullvarefabrikk. She also holds workshops, translates and formats patterns for Norwegian magazines and fellow designers. Her craze is designing classical garments with a modern twist incorporating cables or lace. Linda’s favorite food is grilled fish, preferably served on a warm evening somewhere in southern Europe. At her home in Norway it will be cod baked in the oven. Linda will give away two of her lovely patterns to readers of this blog. Please comment below! What started your crafting frenzy and when? I learnt at school at the age of 10 but needed a lot of help from my mum. I began designing in 2008, after tweaking so many patterns to make them fit me. Shortly afterwards I was asked by a Norwegian publisher if I wanted to make a knitting book, and that was a great challenge for me. Knitting in Norway is an extremely popular hobby with a large percentage of women taking part, especially due to the long tradition of handcrafts and long winter evenings. The knitting scene is focused on stranded colourwork, either all over or with classical borders, on straight pullovers for skiing or straight cardigans called “kofte”. The garments are mainly steeked and finished using a sewing machine. So moving to the UK I discovering a very different knitting world ignited my love for cables, lace, a more feminine silhouette and professional finishing. My first special design is my Aran Bolero, that ended up on the cover of my Norwegian knitting book. I am pleased with the combination of cable patterns, how well the yarn fits the design and the overall silhouette of it. Women who like elegant and stylish garments, at least that is what I aim for. I am still in the process of unpacking my boxes of garments, yarn and workshop materials since our move in April. 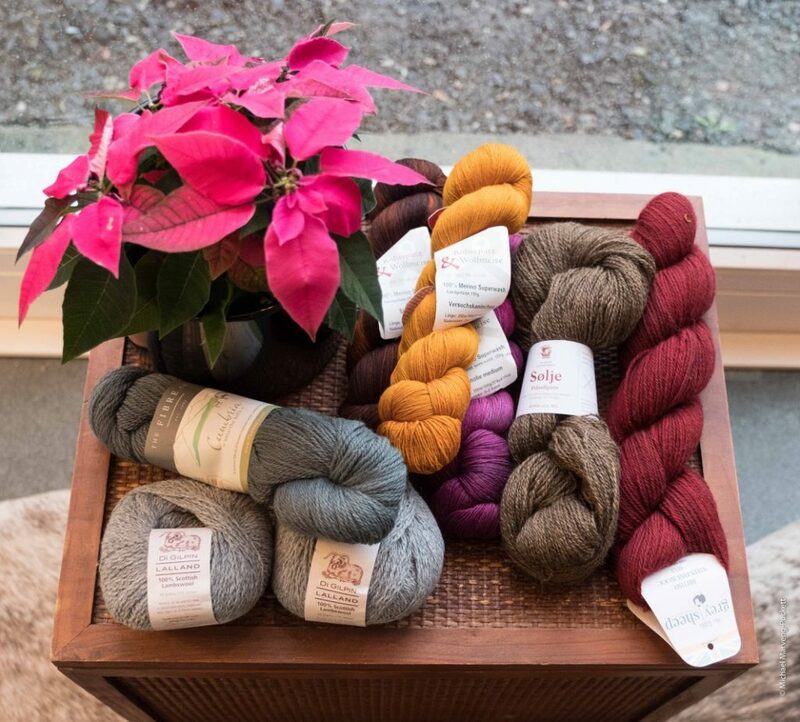 But I am incredibly fortunate to have both a studio and a yarn bunker in our new home. Here is a photo of some of my treasures from my stash. Any yarn I find gorgeous due to its fibre content, its heathered or hand-dyed shade and resulting stitch definition. Inspirational stitch bibles and books like Norah Gaughan’s Knitted Cable Sourcebook. Sculptural shoes and statement jewellery are also pure cryptonite for me. I am working on a new design submission for Interweave Knits, hence I cannot show you that. I do not have any extra time to knit anything else than my samples of my new designs these days. My favourite weapon is my Signature knitting needles. Which is your source of inspiration? I am influenced by fashion designers but also by architecture and sculptural lines as well as nature itself. I find inspirations in magazines, books, on Pinterest and just by walking around observing. Do you have a partner-in-crime designer/critique/best friend that works with you? I work on my own designing but have several talented knitters who help me make samples. I am fortunate to have my husband doing all my graphical work including making my logo. Last spring, I also had an exciting collaboration with an acknowledged Norwegian crime author, Hanne Kristin Rohde, who wanted to make a design for her protagonist called Wilma Lind. It resulted in a jacket I called Wilma Lind Jacket and a lot of press coverage in Norway. Which designer/s participating in the GAL caught your attention and why? I have started to unveil the 7 new designs I have created that where professionally photographed in October, so do follow me. Here is a sneak peek of Donia, a poncho made for Hillesvåg Ullvarefabrikk. I am styling it with a belt and I am wearing my Helka (cover picture) with Saqqara on top assisted by Hair & Makeup Artist Sissel Fylling. I have not knit that many traditional sweaters in my life, probably less than 10 and most of those have been gifts. As a teenager I loved wearing my dad’s old sweaters that my mum had knitted in her youth. My oldest nephew is wearing some of those now. Linda will give away two of her lovely patterns to readers of this blog. Which is your favourite of her patterns? Please comment below! This is such a hard, hard question to answer! Nope I’ll have to go with 2. When wanting to feel like a glam queen I’d have to say Kohno Kimono. Oh my goodness how does a person choose just one favorite?? I love Caballo. So many tiny details that make it stand out! Congratulations! You won a free pattern from Linda’s Ravelry store! Happy knitting! Above all, thank so much for your blog post/interview, very interesting! you’re welcome! Don’t miss the other interviews and giveaways on this blog! There will be many more before Christmas! oh, now that I’ve discovered your blog, thanks to Linda, I will not miss a beat! Too many to choose from and every time I look at her portfolio I find something new that I like. Right now I’d have to say my favourite is Beckside, though it might be tied with Oydis Sweater. Awesome Linda! It’s a pure pleasure to be knitting and wearing your design! I love all of Linda’s designs. Cannot choose just one, but Gyda, Adoe, Gaylia and Melva are right up at the top of my favourites. Oh and for something different, White Mountain Ruana was recently published in Interweave Knits, and that is definitely on my needles for winter. Lovely sweaters of every type. My favorites were Idunn and Oydis. Both have the most gorgeous cables! I could write a long list of my favorites, but I would like to knit a poncho, and I love “Iglu”. I lived in Bergen for 3 years, a long time ago and knitting was my hobby. Love all your patterns! So much beauty! Artistry I hope to be able to perfect some day!